Xi Jinping stands after casting his ballot during a vote to repeal presidential term limits during a session of the National People's Congress at the Great Hall of the People in Beijing on Sunday. 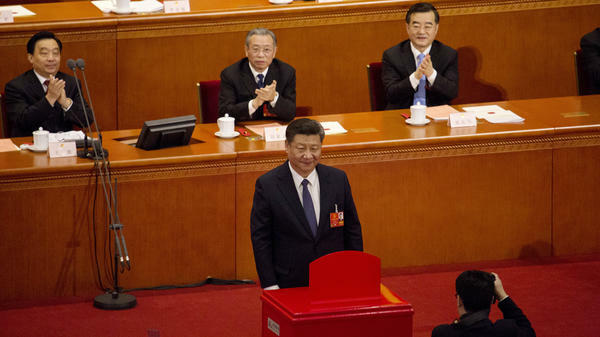 President Xi Jinping of China is poised to rule the country indefinitely after Chinese lawmakers passed changes to the country's constitution abolishing presidential term limits. The amendment was sure to pass the country's rubber-stamp legislature, the National People's Congress, which voted 2,958 in favor, two opposed and three abstaining. Since Xi assumed leadership of China's Communist Party in 2012, he has rapidly consolidated power to levels not seen since the era of Mao Zedong. The constitutional change officially allows him to remain in office after the end of his second term in 2023. "In some ways, the move represents the end of China's 40-year-long reform era," NPR's Anthony Kuhn explained last month, when the proposed changes were announced. "The era began after the death of Chairman Mao Zedong in 1976, when China tried to move away from the political violence and cult of personality that characterized his rule." The two-consecutive-term limit to China's presidency was put in place by Chinese leader Deng Xiaoping in 1982 "in order to avoid the kind of chaos and tumult that can sometimes happen when you have a single authoritarian leader, as China had with Mao Zedong," Elizabeth Economy of the Council on Foreign Relations told NPR's All Things Considered. The change in presidency aligns it with the other posts Xi holds, as head of the Communist Party and head of the military, neither of which have term limits, Kuhn says. The National People's Congress approved two additional constitutional amendments, including "the addition of a political philosophy called Xi Jinping Thought to the constitution, and the creation of politically driven 'supervisory commissions' tasked with investigating party members and civil servants," The Guardian reported. Xi signaled his strength last year when he had his theories added to the Communist Party charter and he bucked the trend to designate a successor at the end of his first term. China's leaders "claim that they're making the move in response to popular demand, but they haven't released the results of any survey," Kuhn adds. "Criticism of the move has been largely censored on the Internet, so it's hard to gauge public opinion on the matter." "In a sign of the issue's sensitivity, the government censors are aggressively scrubbing social media of expressions ranging from 'I disagree' to 'Xi Zedong,' " The Associated Press reports. "A number of prominent Chinese figures have publicly protested the move, despite the risk of official retaliation." Though the AP adds, "To be sure, Xi's confident, populist leadership style and tough attitude toward official corruption has won him a significant degree of popular support." China's state-run news agency Xinhua described the event simply, with the headline: "China's national legislature adopts constitutional amendment." The agency said the constitutional changes have "won approval from both inside and outside the Party, is of historic significance for ensuring prosperity and lasting security of both the Party and the country."